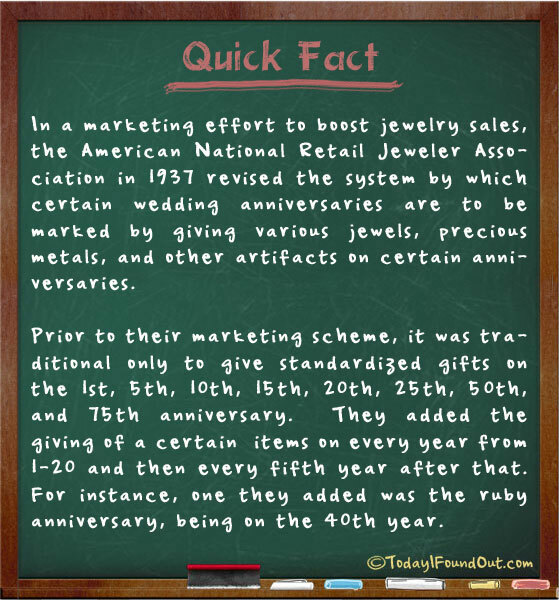 In a marketing effort to boost jewelry sales, the American National Retail Jeweler Association in 1937 revised the system by which certain wedding anniversaries are to be marked by giving various jewels, precious metals, and other artifacts on certain anniversaries. Prior to their marketing scheme, it was traditional only to give standardized gifts on the 1st, 5th, 10th, 15th, 20th, 25th, 50th, and 75th anniversary. They added the giving of a certain items on every year from 1-20 and then every fifth year after that. For instance, one they added was the ruby anniversary, being on the 40th year.